Polocrosse is a combination of polo, lacrosse and netball. Typically a hard, fast sport played outdoors with plenty of room for clean enthusiasm, it is a team sport that encourages camaraderie between team members. Polocrosse was first played in Australia in 1939 and riders throughout the country were immediately enthusiastic about the sport. Polocrosse is now played in more than 18 countries throughout the world – the first World Cup Championships were held in Australia in 2003. 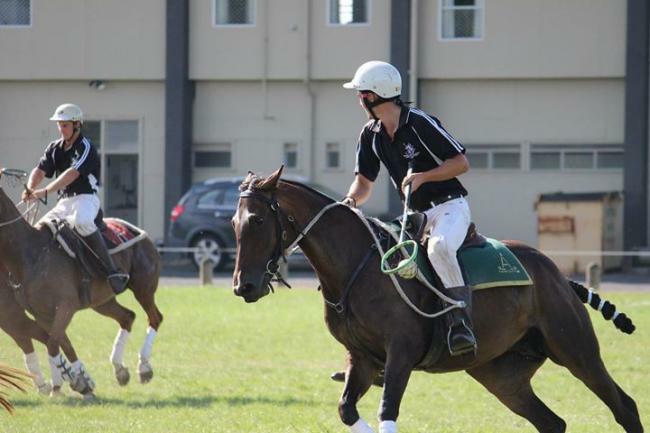 Polocrosse is expanding internationally and NZ regularly has teams attending competition in Australia and further afield. It has contributed to a steady growing interest in horses and horsemanship while promoting close friendships between team members nationally and internationally. Many NZ riders use the Australian Stock Horse in their chosen sport of polocrosse. These are fast, sure footed and reliable horses with a trainable mind. A team consists of six polocrosse players dressed in uniform, divided into two sections of three who play alternate chukkas of six or eight minutes. A full game comprises four to eight chukkas. The three players in each section consist of a No. 1 (Attack/Goal Shooter), a No. 2 (Centre) and a No. 3 (Defence/Goal Defence). The No. 1 is the only player who can score a goal and must be in the goal scoring area at the time. The No. 3 is the only player able to defend in the goal scoring area, whilst the No. 2 is the pivot member of the team and can only play in the centre area. The field consists of three sections – a goal scoring area for each team at alternate ends of the field and a centre field area where all players can attack the other team to gain possession of the ball or if in possession of the ball, use their skills to obtain a goal. When crossing the designated areas on the field, the ball must be passed between players or bounced across the line. To commence the gain, an umpire will throw the ball amongst players in the centre field area where players can catch the ball or pick up the ball from the ground. Players may then pass the ball amongst team members or hit the ball out of the opposition’s racquet. The game requires many skills – it is fast and aggressive.